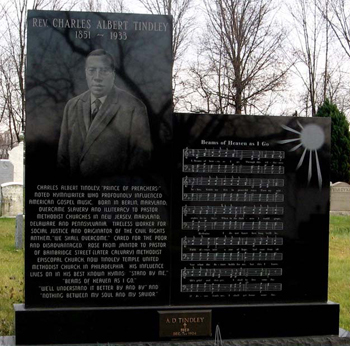 Tindley was born in Worcester County, Md., the son of Charles and Esther Tindley, but his mother died when he was only 2 years old; thus his father raised him. Tindley moved to Philadelphia as a young person, attending school at night. He said, “I made a rule to learn at least one new thing—a thing I did not know the day before—each day.” He was self-taught, never graduating from college or seminary, yet acquiring and reading more than 8,000 books in his library. He learned Greek through Boston School of Theology and Hebrew through a synagogue in Philadelphia. Tindley was awarded two honorary doctorates of divinity from colleges in North Carolina and Maryland. Granted a license to preach from Bainbridge Street Methodist Church in Philadelphia, where he was employed as a janitor between 1880-1885, Tindley became a member of the Delaware Annual Conference. In 1902 he was assigned to Bainbridge Street Methodist Episcopal Church, this time as its pastor. Tindley inherited an overcrowded church that continued to grow quickly under his leadership. The area was economically depressed, especially for African Americans during this time. Our hymn undoubtedly speaks to the difficulties that many of Tindley’s parishioners faced.